New in version 1.42, MidiBridge includes a module that converts (binds) incoming MIDI messages on a port to inter-app OMAC fast-switch messages. This feature allows you to switch between apps using buttons (or keys) on a MIDI keyboard/controller or a remote app like TouchOSC running on a separate device. All Audeonic apps are fully OMAC fast switching compliant and hopefully other devs will update their apps to support the switching too. If you want your favourite app to be included in this, just hassle the developer of said application to incorporate the OMAC registry class (free, unencumbered open source) into their app. If a dev needs information/assistance about the OMAC class and registry just point them to our email address and we will do what we can. With your list of codes, think about which order you would like the apps to be switched when using the Next/Previous commands as you will configure the apps in that order in the App Selector module. 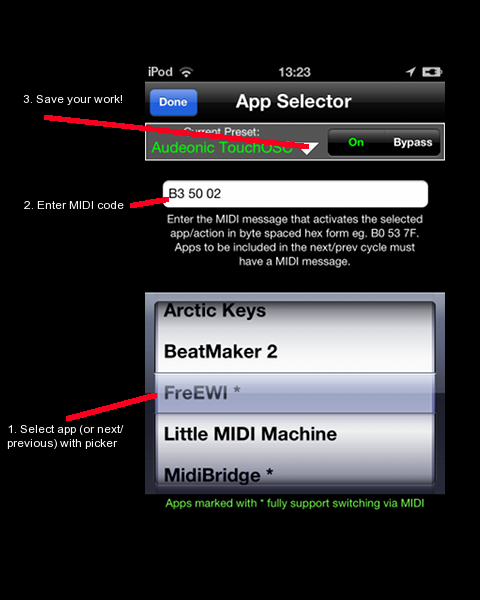 You need to add these messages to the app you want to switch to (or the Next/Previous commands) in the MidiBridge app selector. Rotate the picker wheel to focus on the first app you want to configure (which will also be the first app in the Next/Previous cycle). If an app is known to be fully OMAC switchable then it will have a star next to it. Apps will gain stars magically via the OMAC registry which gets downloaded to your device when the registry is updated by OMAC. In the white text box enter the MIDI message that you want to trigger a switch to the selected app and press Done. MidiBridge will sanity check the data and if OK will set the value. If you get it wrong, check your message format and try again. Remember to separate each hex byte with a space. Repeat the above for each app you want to control, and finally enter the codes you want to use to trigger a Next or Previous app switch by entering the appropriate MIDI code when the picker is focussed to Next or Previous. Save your work by touching the white down-pointing triangle and using the Save button to name and save your preset so it can be used on any port in MidiBridge. Note, that you can configure a message to switch to a non-starred app, but the switching will only work if a fully OMAC compliant app is in the foreground. Once you switch to a non-starred app, then you will have to switch away from that app manually by doing the double-tap on home button or if the app has a fast-switch UI you can use that. Hopefully, you chose the MIDI port to configure the App Selector from which your MIDI switching messages will come into MidiBridge. If not, don't worry, as since you saved your efforts in a preset, you just need to touch the beaker icon on the relevant port and load in the saved preset into the App Selector module. Don't forget that you can turn on an App Selector on a MIDI destination port too and you could even program switching messages to be generated from an onboard MIDI sequencer and have it switch between apps at certain times during your performance. That wraps up the configuration of the App Selector. As always if you have any suggestions, comments or just need help in setting things up with MidiBridge you can email us or nudge us on twitter.